In this day and age, Skype interviews are becoming more and more common. To some, they can appear daunting and intimidating but with a few tips and tricks, you can conduct yourself the right way and make a great first impression. Stability: Ensure your screen is stable and fixed. If you are using a computer/laptop, great. But if you are using a mobile phone it is imperative to keep the screen still. Prop it up on a solid surface. Do not hold it in your hand and constantly move around. Centered image: Check how you will appear to the person you are skyping. Test the camera and make sure your face is centered in the middle of the screen. Good lighting: Again, make use of the camera and check that you are well lit, not in the shadows. Profile picture: Profile pictures are a huge insight into the person being interviewed. 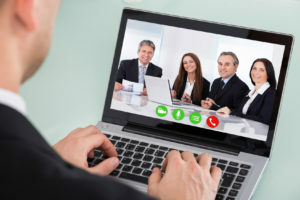 If you know you are going to be participating in Skype interviews, make sure you have a presentable picture of yourself as your profile picture. Refrain from using anything with your tongue sticking out, lots of skin on display or group photos of you and your friends. A simple head shot is more than sufficient. Username: If Skype is going to be used on a professional basis, avoid using nick names or anything derogatory or offensive. Punctuality: A good idea is to make sure you are online 10 minutes before your allotted interview time to show punctuality and dependability. If you know the Skype ID of the person interviewing you, send them a polite message to inform them that you are online and looking forward to their call. Manners: Be polite at all times. Talk clearly and concisely. If you don’t understand a question or didn’t hear your interviewer clearly, politely ask them to repeat themselves. Don’t fall into the trap of thinking there is less formality over Skype. It is still an interview and must be conducted as such. At the end of the interview, thank the interviewer for their time and that you look forward to hearing from them soon. Appearance: Even though you may be Skyping from the comfort of your own living room or kitchen, there’s no need to show the interviewer that you’re just chilling at home. Make an effort and dress smartly. Depending on the role, there may not be the need to dress in a full suit, but a nice shirt will make the right impression rather that some old tatty t-shirt. Hopefully, now that you are quipped with a few rights and wrongs of Skype interviewing, you can feel more relaxed and prepared. If you need to download Skype, you can do so here!